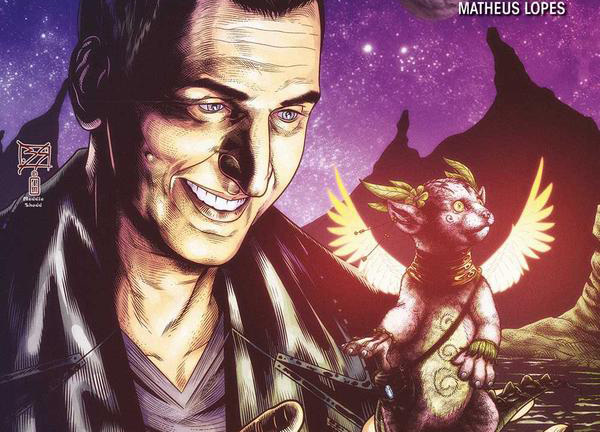 Doctor Who: THE NINTH DOCTOR #5 Review @comicstitan | Warped Factor - Words in the Key of Geek. Ha. Of all the mysteries seeded in issue #4 of the Ninth Doctor comic-books, we knew the sudden appearance of the Aurora Borealis over San Francisco would be the one to explain them all. Teenagers flying. Living gargoyles. Piece of cake. Aurora Borealis over San Francisco – that needs a proper explanation. So, gratifyingly, Cavan Scott delivers one that ties everything together, while also giving us an entirely unexpected message out of left field, but one that’s in the best traditions of science fiction. Oh the message is the human race’s chronic inability – or often rather cynically-driven unwillingness – to see and accept the consequences of our actions if they’re at all remote from those actions. Smoking and lung cancer, second-hand smoke and bronchitis, CFCs and ozone depletion, fossil fuels and global warming, you name it, we’ve been chronically stupid about it. As we write this, enough of the Arctic has melted to necessitate new shipping routes and regulations that, bless them, will save shipping companies money because they can now sail over what used to be solid ice. Just saying – you can never go wrong betting on our capacity as a species to be idiots. While the danger in this comic-strip is refreshingly not our fault, the idea of a transport system that has horrifying consequences, that’s messy and nasty and reversible only up to a point punches us pretty hard where we live in blissful, easy impotence. Meanwhile, there’s plenty of running around to do – Rose has fallen in with the Super-Friends, though that goes south in a big hurry over their stance on gargoyles, Rose showing again, as she frequently did on screen, exactly why she’s worthy of the universe, protecting the gargoyles from a kicking because she knows nothing about them, and neither do the people doing the kicking. That means in Rose’s mind, they’re innocent and interesting until they prove themselves otherwise – not a mindset that endears her to the teens, who have yet to make the connection between their strange new powers, people’s disappearances, and the sudden existence of the gargoyles. See? Cause, effect, cluelessness. Jack proves his usefulness here by opening up a rift (speciality much? ), and we get a handy and timely reminder of the fact that a great big chunk of his backstory was mentioned in his first appearance on screen, and then for the most part entirely ignored at least until his Torchwood days – the memories that have been stolen from him by the Time Agency. He grumbles that they’re supposed to be finding them, but as he’s beginning to appreciate, life on the Tardis tends to make a mockery of any plans for purposeful travel. As for what in the faintly ludicrous hope of maintaining spoiler-freedom in this review we’re going to call ‘the person who called the Doctor in,’ there’s less in the way of point or action for them here than there was in the previous issue, though they do get to show off a bit of action heroing against a couple of giant bumblebees, so it’s not as though all is lost in terms of having them here. The actual mechanism of the plot (the transport system we mentioned) is a little vague and random, working better as a metaphor for our own oil-driven idiocy than as an actual thing – but the idea of a transport system that gives off a radiation that changes the world, first in interesting ways (‘Global warming? We live in Britain, bring it on!’) and then in catastrophic ways (‘What do you mean, a Biblical flood?’) is sufficiently close to home that we allow it in, irrespective of gaps in the equation, like why a form of radiation should mutate humans in specific ways so as to enable them to fly without wings, or why it should spawn the gargoyles particularly. Science fiction allows a certain amount of ‘because it does, that’s why!’ and if the story’s good enough, as it here, and has something to teach, as it does here, we as readers are usually quite happy to wink at it and let it pass. In terms of the artwork, Adriana Melo, and Matheus Lopes on colour continue to deliver – while there’s not an enormous amount that marks the gargoyles out as a ‘special’ monster, the necessity to get the humanoid characters right in this story is higher even than normal, and Melo delivers almost across the board, with perhaps one character less exact than they should be, but the rest giving us everything we need – be they familiar to us as a Tardis crew or new as the flying teens, they feel real and distinct here, and the artwork pushes the story along at an agreeable lick so it never gets bogged down in its meaning or its message, but still works very well as punchy, against-the-clock Who with a fresh feel and a good bolt of energy. Oh and you’re going to want to read this one to its final panel. It’s not exactly like a Marvel movie treat, as it’s ‘pre-credits,’ but there’s a real Easter Egg at the end of this issue, which makes us go ‘Oooh!’ about the potential for future stories, or, if nothing comes of the idea in the final panel, at the very least makes us go ‘aww’ in nostalgic wonder. You want a bottom line? It’s Cavan Scott writing the Ninth Doctor, go get. 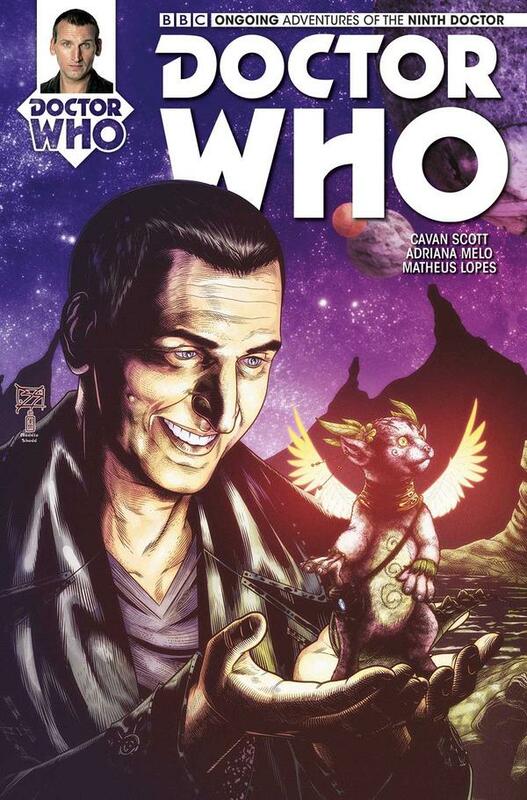 A more issue-specific bottom line would be that this one takes the premise of the previous issue and turns it into proper, lesson-teaching science fiction while belting along and giving us some classic Ninth Doctor and Rose action. Seriously, go get.